As they do to many others, the dark and cold do a lot to weigh my motivation down in January. This morning I slept past my alarm and was absolutely not interested in getting up. I was less interested in shuttling smallish bears to school or going to work. My cozy little apartment was so warm and inviting. Before I even got out of bed I was trying to think of good reasons not to go to my first yoga class this afternoon. I packed my bag and mat anyway. Once I got to work, I started to look forward to class. And then work got crazy and I almost couldn’t leave. I raced to the car, hoping there was still enough time to drive to the studio, find a parking place, change, and make it to class on time. 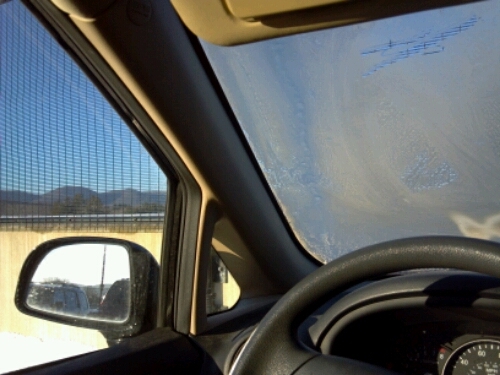 When I got to the car the entire inside of the windshield was covered with ice. All of the other windows were completely clear. What a change from the dark early morning! 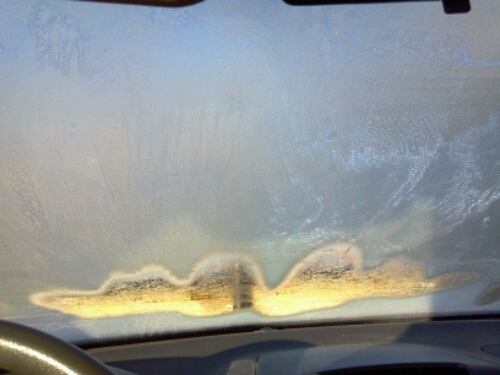 I cranked the defroster, thought warm thoughts, and determined I was going to get to the studio no matter what. It was worth it. We were asked to think of an intention for the hour or for ourselves in general. Healthy balance. Nothing is between this and me. Nothing will keep me from reaching that place. Neither cold nor ice nor dark of January. Nothing. Well done. Thank you for sharing this! Love you.